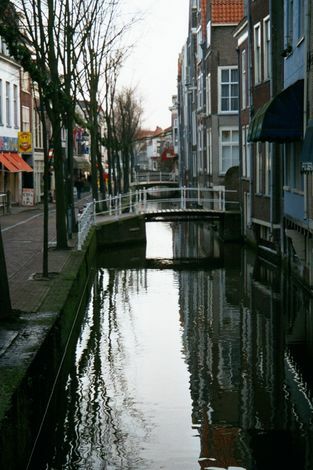 A pedestrian can hardly avoid the churches and canals of Delft, but without a guide (alive or otherwise) you'll probably miss the many relics of the city's involvement with the Far East. 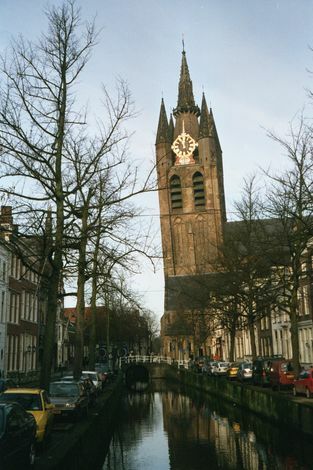 Oude Kerk, its "toren" leaning over Oude Delft canal. The tower probably leans because the Oude Delft canal was moved slightly to make room for it--leaving behind soft ground. 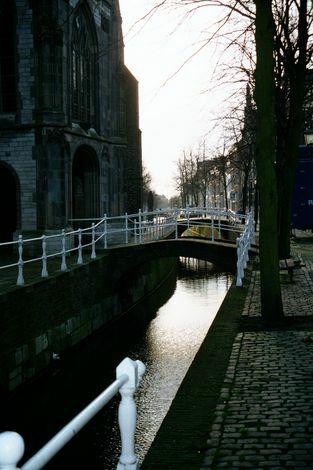 The Oude Delft canal curves deviously around that Old Church. 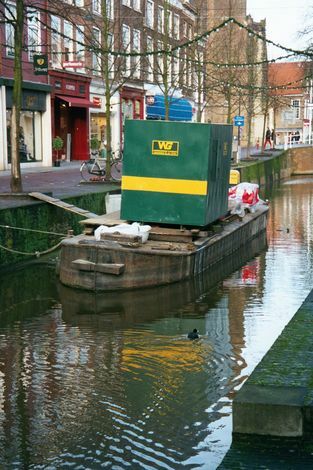 The canals are still in modest use. Unused, they still add value. 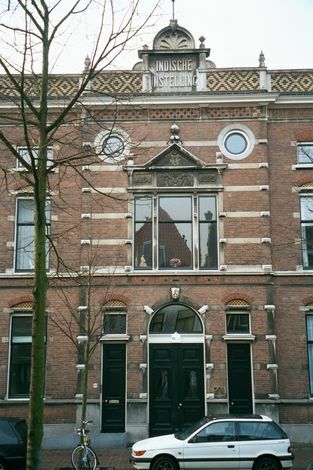 Here, the Voldersgracht, just north of the Markt. 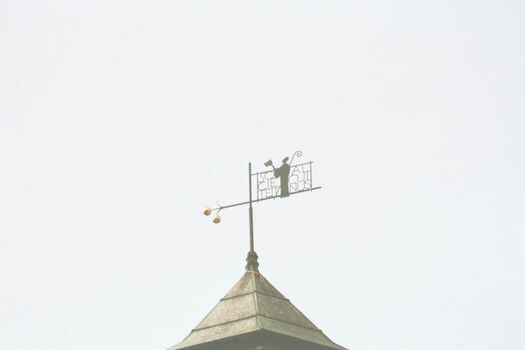 Yes: a weighing-house. The plaque below, if you can't make it out, states that in 1770 the gold- and silversmiths guild had its chambers here. 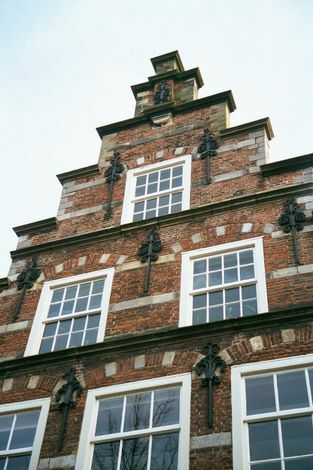 A stepped or crow-step gable. Here, not far from the Kolk, were the headquarters of the Dutch West Indian Company. 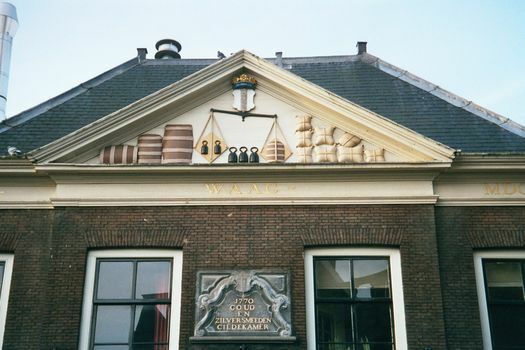 The address is Lange Geer 28; the dates of occupation by the Company, 1638-1649. 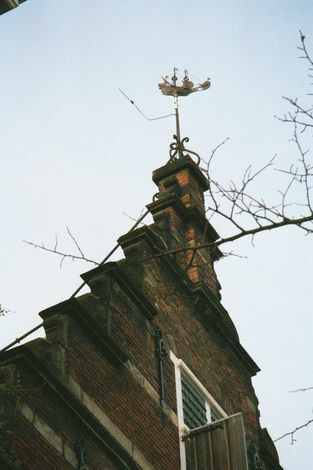 A similar gable, a similar venture, but the weathervane is an East India ship--and it doesn't deceive, because this is East India House. 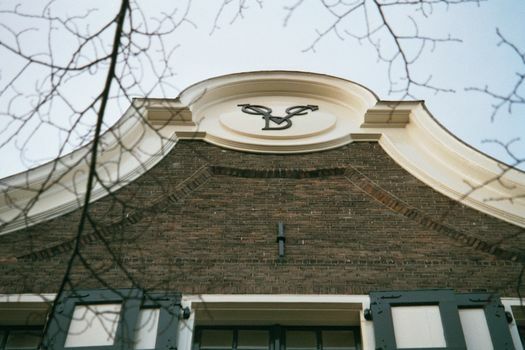 Street level on the same building has a plaque with the initials VOC:D. Translation: United East-Indies Company: Delft Chamber. The VOC's other chambers were in Middelburg, Rotterdam Hoorn, Enkhuizen, and--most important--Amsterdam. 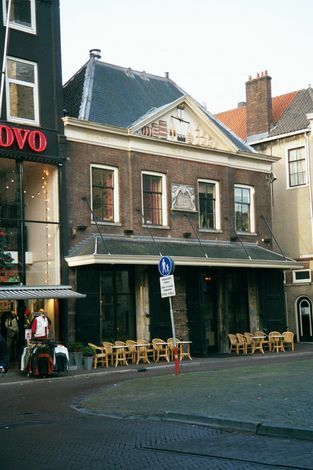 Here in Delft, the chamber had seven directors, elected by the chamber's shareholders. Inside the building's courtyard, signs of its previous life as a warehouse. 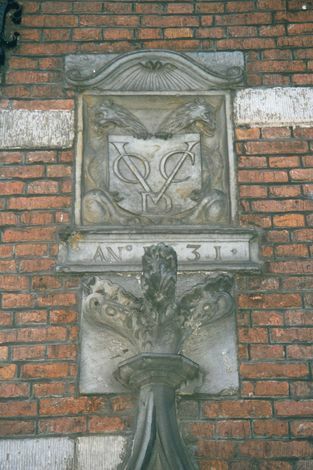 Another monogram, in the same courtyard. 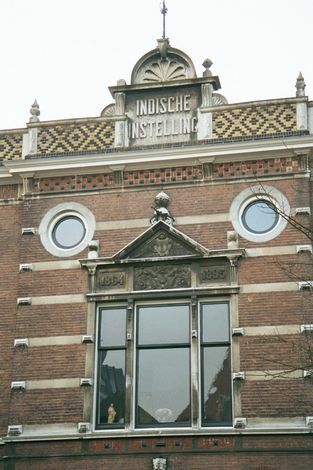 East India House, as it was known until the company went bankrupt in 1799, is now a dormitory for the Delft technical university. Why bankrupt? 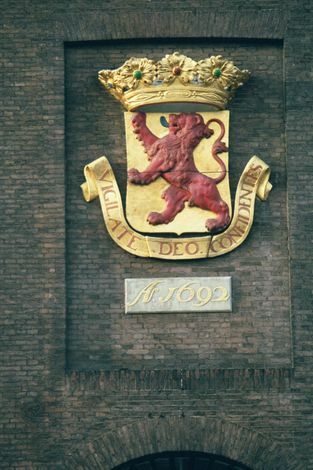 Part of the answer is told in an old joke: the letters VOC stand for Victim of Corruption. 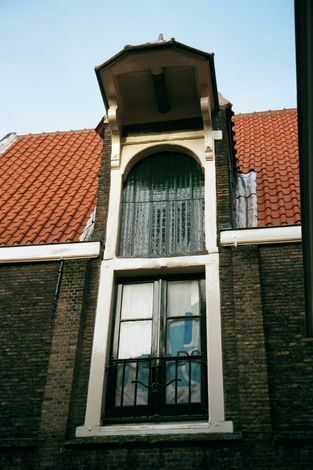 The VOC flourished for about two centuries--long enough for the East India House to be complemented by a warehouse on the other side of the Oude Delft Canal. Here it is, now a museum, but still ready to hoist in spices and cloth brought to its side. The brick building to its right is the Armamentarium, an arsenal and successor to the powder magazine whose explosion almost destroyed the city 500 years ago. A shepherd? 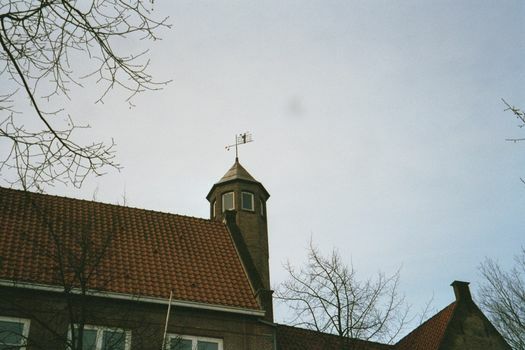 Well, this is the Sint Barbara Klooster (convent), which served as an orphanage from 1579 to 1910. It's very near East India House, and during the life of the VOC some 800 boys left from here for the East Indies. Girls, too, though that stopped when someone noticed that most of the girls died on the voyage out. Just as the British took over the work of the East India Company, so, too, did the business of the VOC come to be a Dutch imperial undertaking. Here, a short distance from East India House, is the Indian Institute, where generations of colonial administrators were trained before setting sail to careers in the East. Close-up: the words are Indische Instelling. A Dutch Warren Hastings? 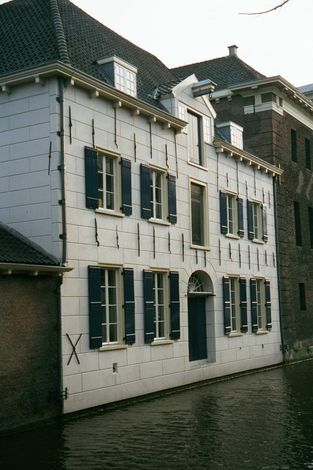 This is Diederik Durven's house, at Oude Delft 95. 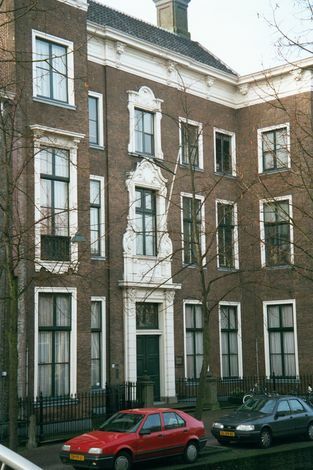 Dismissed as governor of the East Indies for extortion and corruption, he returned to Delft in 1732, knocked down three houses, and built this manor. At the time of his death in 1740, he had still failed to vindicate himself. 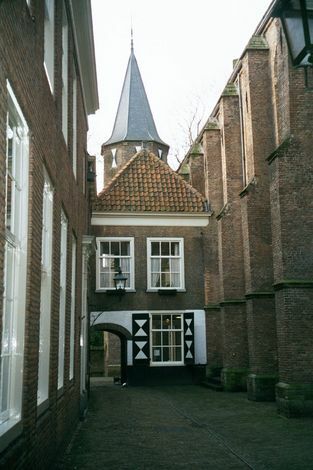 The Prinsenhof, a museum now. Through the passage, there's another museum, one dedicated to the East Indies. Upstairs, a gamelon orchestra plays. Surely it's a recording. No: it's live. Who are the musicians? Perhaps eighteen out of twenty are the descendants of the same people who set sail 400 years ago for Batavia. Strange: the attachment is stronger on this side of the imperial connection than on the other. Or, maybe, not so strange!